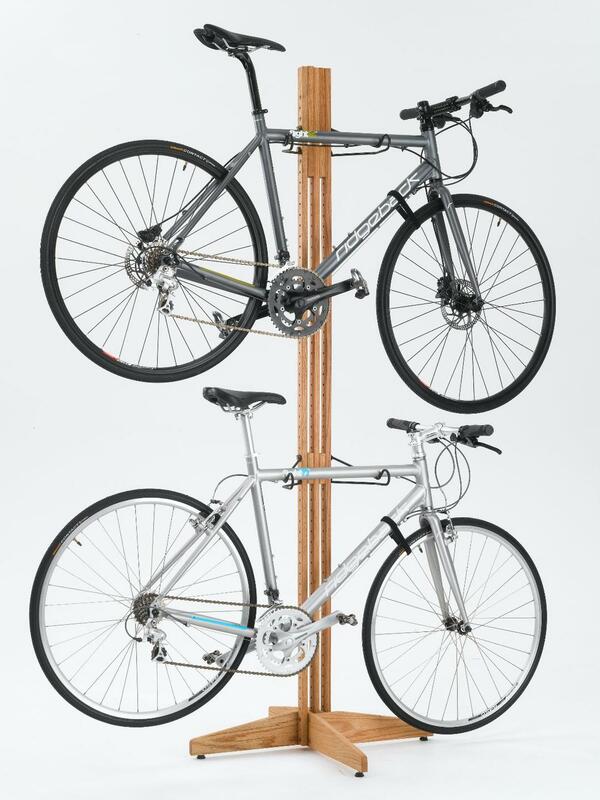 The OakRak Free-Standing Bike Rack is made of furniture grade American Red Oak with a hand rubbed oil stain and finish. This rack is a great storage solution for home, office, or any location with high, angled, or drop ceilings. 28" footprint, conserves space and provides excellent stability for up to 4 bikes plus our other add-on accessory kits. It stands 80" high and provides plenty of storage space for even the largest road bikes. Our unique independently adjustable arms allow for storage of almost any type of frame. Two-way Velcro straps are included to stabilize your bike's front wheel to the frame when bikes are stored on the rack. 200 lb capacity. Assembled dimensions 81.5" high, 28" wide, and 28" deep. Weighs 15 lbs.